This year’s edition of the Ryder Cup competition, between the best pros in American golf and the best of Europe, will take place in Wales a little more than a month from now. As the tournament approaches, golf fans might consider brushing up on some Ryder Cup’s history, courtesy of two books I reviewed in this column several years ago. Both books are still available at Amazon.com and other outlets, and well worth the modest effort to find them. The first one, Mr. Ryder’s Trophy, is a work of fiction, but sometimes novels have a way of being closer to the full truth than you might think (Sleeping Bear Press; $22.95 SRP). The author, Shirley Dusinberre Durham, is an accomplished amateur golfer and past committee member of the USGA. Her first novel addresses several related themes, while centered around two mysteries concerning the origins of the Cup: why did Sam Ryder create and sponsor this international competition, and who is the golfer appearing on the top of the famous award? In 1976, Mr. and Mrs. Steven Winchester find themselves transferred to England for his job managing a factory north of London. Mrs. Winchester discovers Samuel Ryder once lived in the town, and still inhabits it in his ghostly form. Ryder and his long-time friend and professional golfer, Abe Mitchell, have decided that this American woman should help restore the Ryder Cup to its originally intended purpose—to give an opportunity for excellent competition among professional golfers, in an atmosphere of sportsmanship and camaraderie. Mitchell and Ryder eventually disclose how and under what conditions Jack Nicklaus will be “inspired” to suggest the creation of a European squad, in lieu of the previously more limited field of players from Great Britain and Ireland. It just so happens that about this same time Mrs. Winchester meets and plays a round of golf with a young English professional named Nick Faldo. 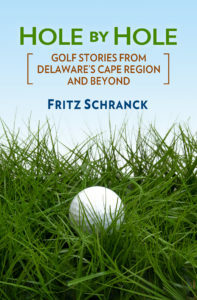 This novel will appeal to avid golfers with a sense of history and an interest in what one might call the morality of golf. 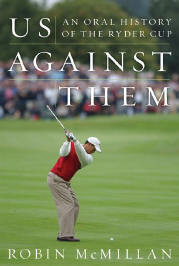 The second book, Us Against Them, is a far more straightforward piece of golf journalism, by Robin McMillan (Harper Collins; $25.95). McMillan describes some fascinating reconstructions of strategy used by Ryder Cup captains during dozens of matches held since 1927. Learning what went into the decision to pair up teams or decide the playing order for the last day’s singles event made for a great read. McMillan went through the archives and tracked down many of the participants for their own take on their experience. Once again I’m struck by how golfers can remember yardage, club selection, and results from rounds that took place decades ago. He also recounts some tales of gamesmanship that some players used to great effect. Seve Ballesteros was a great match player not only because of his scrambling ability, but also because he was able to make his competition think more about him than their own game. On the other hand, Paul Azinger and other American golfers were able to unnerve their opponents, and not just with their swing technique. Based on what these interviews divulged, the winning strategies are actually pretty simple. In foursomes, the alternate shot format, make sure each team has one player that can keep the ball in play, and another player capable of streaks of brilliance. In four-ball, try to pair together players with similar temperaments and ball-striking abilities. For the singles matches, however, the best strategy seems to be to always lead off with your strongest players, and overwhelm the other side before the final match of the day. Both sides have certainly won without using this tactic, but they’ve also unwittingly increased their odds of losing when they didn’t. Sometimes, they’ve been forced to watch in stunned disbelief as their side lost, when they didn’t lead with their best guys first. On two recent hot, muggy days, the ladies of Rehoboth Beach Country Club played their Club Championship, which required a five-way play-off among the competitors. Bailey Scheurer won the gross competition with a 174 total. Dale Lipnick took second place. Judy Bennett won the Second Flight, while Suzanne Moore was the runner-up in that category. Karen Storms won the third flight with her 191, while Kathy Carroll took second place with her 207.